A Few Good Men: What Kind of Man Will You Be? A Few Good Men presents the reader with 10 positive role models from the Bible. From Obedient Noah to Loyal Onesiphorous, these character sketches combine dramatic story-telling with challenging and insightful comment. What kind of man do you want to be? Who do you admire? Rugged sportsmen, smooth film stars and wild rock musicians all compete for our admiration. But are these men the role models that we should aspire to be? Solidly founded on biblical narrative, these chapters will challenge and inspire readers to examine the struggles and temptations of these biblical men who face the same struggles that men still face today. 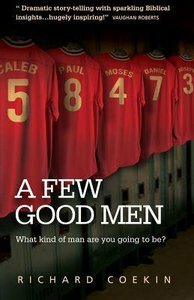 About "A Few Good Men: What Kind of Man Will You Be?"